As Calgary marks five years since the city suffered the costliest flood in Canadian history, Naheed Nenshi says the memory that stands out most for him is a simple home-made sign posted outside a house in Bowness. It read: "We lost some stuff. We gained a community." That sentiment encapsulated for Nenshi what he described as the "most remarkable outpouring of humanity I've ever seen." 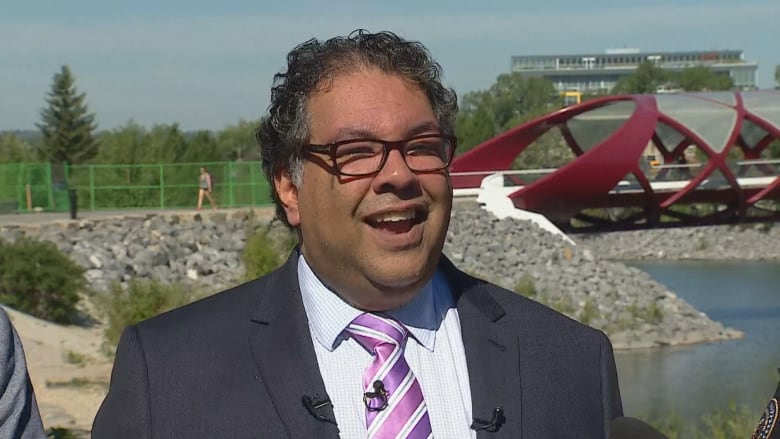 Nenshi spoke to the media on Wednesday by the banks of the Bow River at the West Eau Claire Park, which is being built on the south side of the Peace Bridge. "Five years ago today, this was under water. 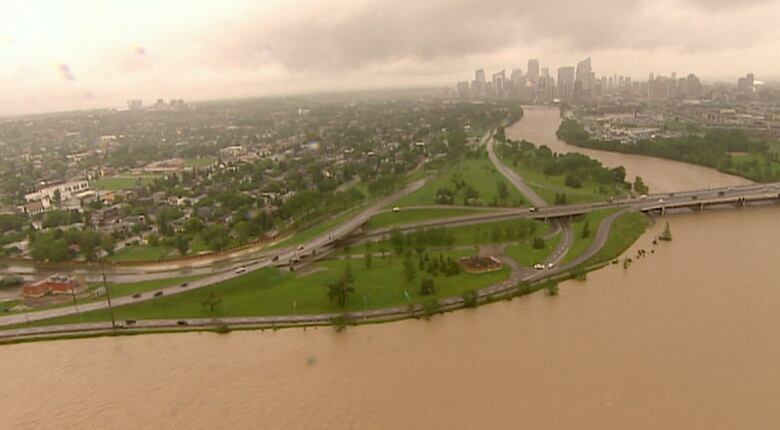 Five years ago today, we undertook one of the largest evacuations in Canadian history all along the south bank of the Bow River," he said. Nenshi recalled standing on the opposite side of the river at 2 a.m. on this day in 2013, watching the swollen river as it spilled its banks. "And I had never seen the river run so fast, so high and so angry before. All I could hear was the rush of the water. And I gotta tell you, I was a little bit scared," he said. But, a short time later, watching how competently and carefully Calgary's police officers and firefighters co-ordinated the evacuation of a seniors complex in Chinatown, Nenshi says he started to feel better. "And I watched the women and men of the Calgary police service treating their fellow citizens with such kindness and compassion and care, and it must be said, with such love, that I knew, at that moment, that our colleagues, that the City of Calgary and all other public servants had this well in hand. That they knew what they were doing," he said. "And that was the point where I exhaled a little bit." The way Calgary came together as a community to help each other in the aftermath of the flood still inspires him, he said. Nenshi said he'll never forget visiting a couple in Bowness whose house on Bow Crescent was ruined by the flood and were beginning to rebuild it. "They'd found a piece of plywood in the garage and they'd scrawled a message on that piece of plywood and they nailed it to a tree in front of their house. And that is the image that'll always stay with me when I think about what happened in 2013. "It said: 'We lost some stuff, we gained a community' — and that's what I'm most proud of." 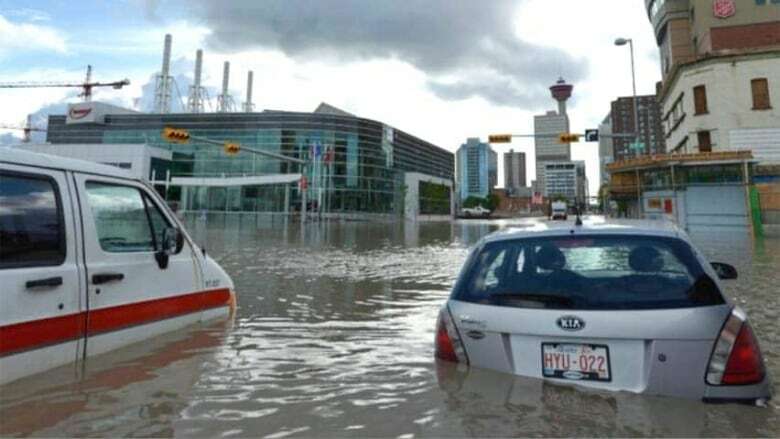 Nenshi says Calgary is now protected against about one-third of a 2013-level flood, with the city and the province having committed about $150 million toward projects aimed at reducing the risk of river flood damage. Sophisticated new river and weather modelling tools and improved emergency response plans. An agreement between TransAlta and the province to manage water levels on the Bow River and be ready to use the Ghost Reservoir to hold back water in emergencies. New gates on the Glenmore dam that will double the capacity of water it can hold back on the Elbow River. New permanent flood barriers to provide more protection to low-lying communities and the downtown core. Stormwater system upgrades to better protect Sunnyside from flooding. Ongoing work with the province to get upstream reservoirs built on the Elbow and Bow rivers. Nenshi said he firmly believes the contentious plan to construct a dry dam in Springbank — delayed because of a review by the Canadian Environmental Assessment Agency — is the best plan for the Elbow River. "It is clearly the best solution and it needs to get built and it needs to get built quickly," he said. Nenshi said it's critical that upstream flood mitigation infrastructure is in place on both rivers. "Without those, we remain a community at risk," he said.